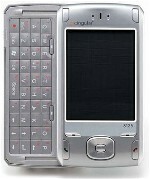 Cingular 8125 Pocket PC Phone features worldphone capabilities, Windows Mobile 5.0 support, quad-band GSM/GPRS/EDGE 850/900/1800/1900 MHz for enhanced global use, integrated, sliding QWERTY keyboard, 128MB ROM / 64MB SDRAM, 2.8″ QVGA 320×240 64K Color LCD Touch Screen, integrated Bluetooth Class II, integrated 802.11b support, Mini-SD slot, 1.3-megapixel camera and is powered by TI OMAP 200MHz Processor. Brighthand reviewed Cingular 8125 PDA phone and concluded that the Cingular 8125 is certainly not a flashy device, and doesn’t stand out dramatically in either specs or features. But it’s solid, and has a respectable mix of features that make it a dependable data device that also does voice. It lacks 3G data, but has the benefits of GSM flexibility. There’s no flash, very little excess of style, and almost nothing in the way of “fun” or non-vital features. But if your main goal is a large, comfortable keyboard on a data-oriented GSM device, the 8125 fulfills that rather well.